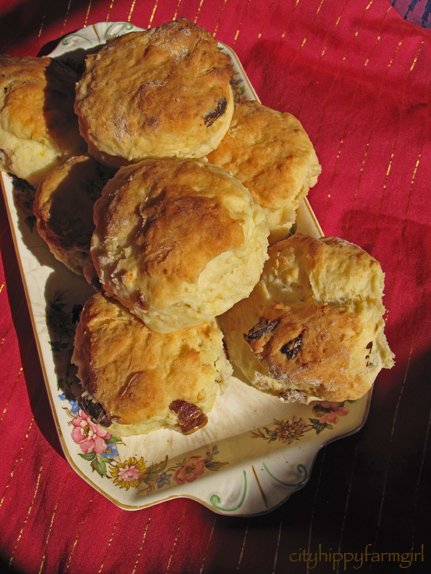 This entry was posted in Food Glorious Food and tagged afternoon tea, date and orange scones, easy, hamlin fistula hospital, international scone week, morning tea, picnic food, scones, simple by cityhippyfarmgirl. Bookmark the permalink. 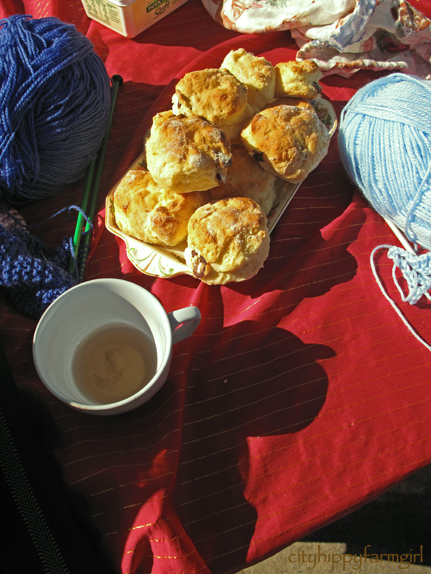 Woollen acts of love coupled with scones — delightful! I’m just finishing up some squares for Wraps With Love. Wonderful Rose. How many did you do? I love scones – just asked my mom for a batch for my birthday. Knitting for me is calming.. I’m working on a sweater right now. I’d love to think I could manage a whole sweater one day… one day. I have never made scones but since you and all my other blogging buddies are making them I think it must give them a try. Sorry I’m behind on your posts but my reader isn’t showing many of the blogs that I am following. I really don’t know what is wrong…even mine isn’t showing up. Scones are delicious Karen. I highly recommend them… especially with jam and cream. These certainly look yummy indeed! Thanks R. I think It’s a pretty awesome cause too. I’ve knitted hat for cancer patients and also worked on sweaters for orphans in Haiti- it is a fantastic way of sharing. Your scones look wonderful- I love oranges and dates! You’re a true knitter Heidi… One day I really hope I am up to that kind of standard. Lovely scones and lovely plate. They do seem to go hand in hand with knitting. Your project sounds great – knitting is a very soothing activity. In fact it is raining outside the right thing to do seems to be to knit and eat scones – alas I have other pressing matters – sigh! I love that plate too. Rescued from the roadside in a pile of boxes destined for the garbage truck unfortunately… well fortunately I got it. I’m sure they would come back easily enough Charlie. Those skills are in there just waiting to be ignited again…I’m sure of it. As for the book, yes, a wonderful read. My mum used to make blankets for Oxfam, they were real sticklers for precision as the blankets are used for a varierty of purposes. She was told that it needed to be tight enough to carry seeds and grain! Not so much for this organisation. (Although they could well use the blanket for other things like that later.) Each patient is given a blanket on admission to go over their hospital gown when admitted. My mother makes quilts for, as she puts it, little babies without fathers, and it keeps her sewing machine rattling along day after day. She loves it. Your scones look perfection, too! Misky can I have some quilting lessons from your mum?? My mum knitted little doll thingys for African children’s hospitals for a while – there was a call for them in Perth and I know she loved renewing her knitting skill for the cause. I need to discover my knitting skill first, but I do love your ideas here. Simply wonderful fun! Love the work the Hamlins do and the book is so inpsiring. A truly inspiring Australian woman. Barbara that’s fantastic. I’d love to see what you get up to and I’m sure the Crafting Womb would love to see what you get up to as well if you want to have a look at their lovely link though FB. Tania I’ve long yearned to do something like this with other like minded souls. The timing was just right… I’d love to have your knitting talents in our tiny group! hi there, out of curiosity i wandered over here and what did i find? my blog tute on joining the squares for Hamlin knitting. Thankyou for sharing, i hope it works for you and your friends. Beautifully timed Kaite. Such a wonderfully helpful tutorial- thank you for doing it. They are beautiful looking scones Brydie. I have never considered the combination of date and orange. They sure sound good. A delicious way to spend an afternoon, even if not much knitting got done in the end. I love the pictures your words conjure up, and I’d definitely like to try one of these scones. Beautiful, Brydie – and about to become my breakfast. Thanks for the inspiration. Guardian Pharmacy runs a knitting for children each year, I have made baby knits for them, worth a look you can find them here – http://www.guardianpharmacies.com.au/guardian-community/programs/2012-guardian-angel-knitting-program/ I love the scone recipe, hubby does a white chocolate scone which is divine! A really beautiful idea, Brydie and a great way to connect in a lovely setting. Our local spinning group is collecting handknitted/crocheted toys for children in need – your post is a great reminder to get moving on that one. I’ve been baking for my work at the hospice. I love the idea of getting a group together to knit for a good cause!